It is not often the French thank the English for anything, but in the case of Chamonix for non skiers and good skiers alike, they cannot thank us enough. It was a bunch of intrepid Englishmen in the 1800s, men like Whymper, Kennedy, Ball, Wills and Tyndall, who, armed with precious little equipment, first explored the Alps and Mont Blanc in particular. They formed The Alpine Club and returned many times to climb the peaks. But it was writer Albert Smith who was responsible for Mont Blanc Mania and Chamonix’s popularity as a resort. After a famous ascent in 1851 carrying over 90 bottles of wine and banquet portions of gourmet food, he celebrated by running a show about it in London’s Piccadilly called The Ascent of Mont Blanc and the rest as they say, is history. His show ran for six years and attracted hundreds of thousands of people. He even performed it for Queen Victoria and created a board game and a dance called the Chamonix Polka! Needless to say, from then on, Chamonix and Mont Blanc became the only place to travel too for the British looking for an active summer holiday, and Chamonix was so grateful to Smith the town gave him his own suite in the Hotel de Londres. Today, Chamonix is still up there as an iconic Alpine resort because of its history and position at the foot of Mont Blanc. 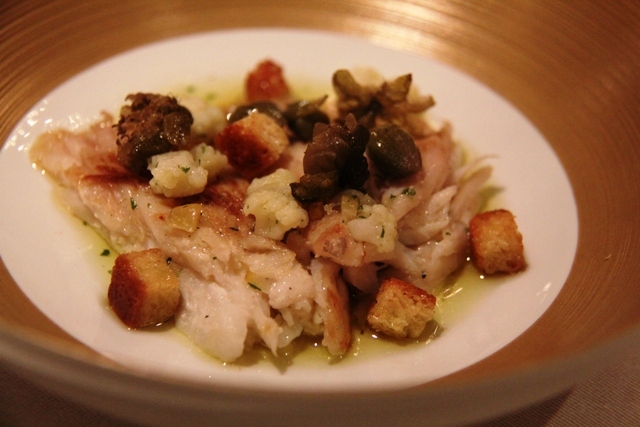 It is a mecca for skiers and lovers of fine food and wine. But is there enough here in Chamonix for non skiers too? 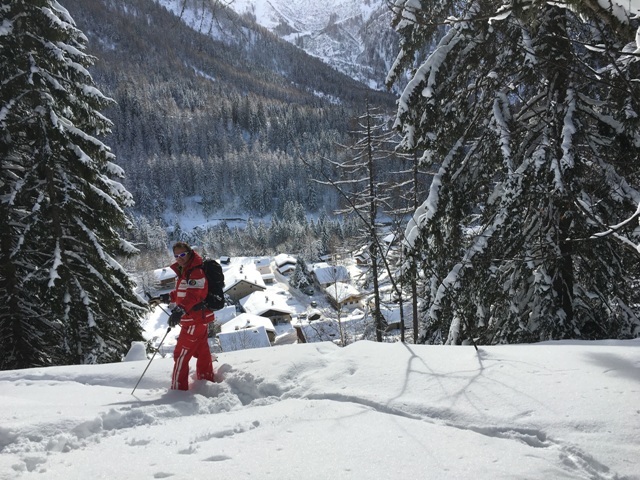 I join mountain guide Sylvain for a snowshoe trek around the foothills of Mont Blanc. 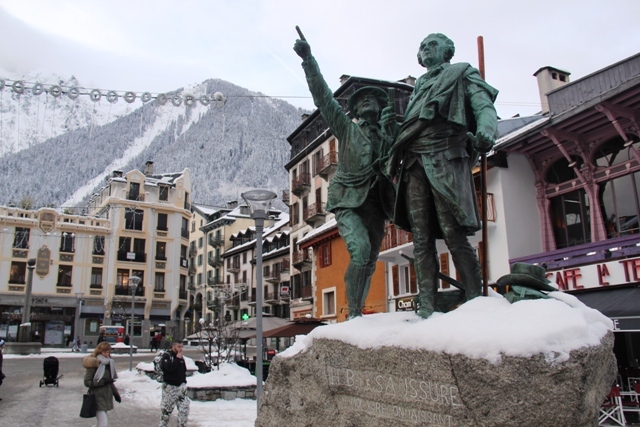 His family, and many others in Chamonix have been associated with mountain guiding for generations. Of course snow shoeing is a piece of cake for someone like Silva who has been doing everything from ice climbing to mountain running for over 25 years. “I was in the opening shot of the Bond movie The World is not Enough” he casually tells me as we walk across pristine virgin snow. As if trekking across five metre deep snow strapped to oversized duck feet was not enough, I had to be doing it with James Bond. I grit my teeth an plough on. After a glorious morning trekking with Sylvain, I walk back to rest awhile at the charming Grand Hotel des Alpes, an elegant relic of Chamonix’s glamorous past, built in 1840. 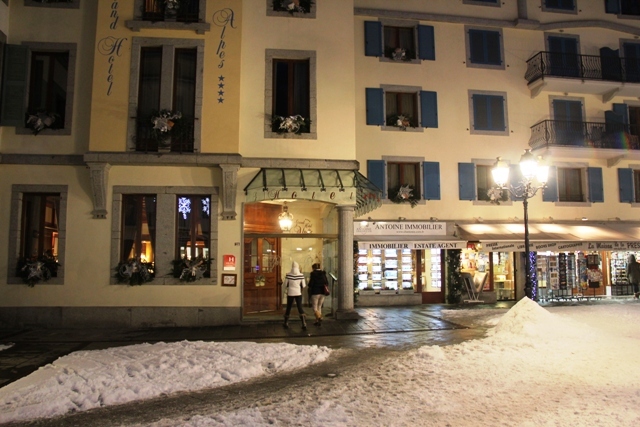 It was renovated in 2004 and now stands proudly once again as a luxury boutique hotel right in the centre of Chamonix. Under the stewardship of the lovely Katia the Grand Hotel des Alpes has rekindled its love affair with the town, offering luxury bijou old world guestrooms and, as a delightful surprise, I discover a free tea buffet at 4pm followed by another aperitif buffet in the evening to ready me for an evening out on the town. As I walk in after my trek, Katia spots my wet clothes and immediately orders me to change to let her dry my things in time for my afternoon adventures. I am beginning to feel this is like my spiritual home from home. There is certainly nothing wrong with a little pampering. The afternoon shines bright as I make my way towards the Aiguille du Midi cable car station just a few minutes’ walk across town. This is my chance to get close to the summit of Mont Blanc without climbing, although I doubt whether Silva has even seen the inside of this; far too easy. Two cable cars and an elevator later, I am nearly 4,000 metres up and it feels like I am on the top of the world. It is -15 degrees and the air is rare up here and I breath in deeply and walk slowly out on to the wide terrace. This is an extraordinary place; a building constructed on the side of the highest mountain peak served by an aerial lift system and the view is jaw dropping. I see the summit of Mont Blanc in front of me, almost within touching distance. 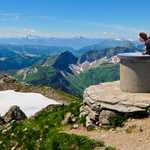 “it looks really close, but actually it is another 1,000 metres higher” says my companion Bernadette. We’re really lucky this afternoon, the cloud cover is far below me; nothing but blue sky framing these majestic peaks. “Shall we step into the void?” asks Bernadette. If it’s got to, I do. We turn a corner and the void beckons. Silent. Haughty. I feel it laughing at me. 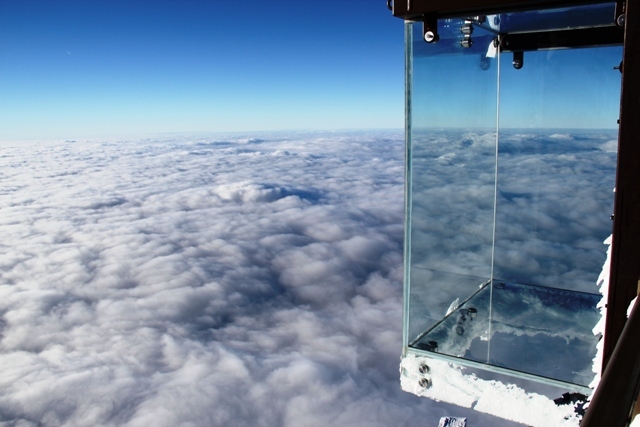 It is just a transparent box I say to myself, which happens to be suspended nearly 4,000 metres in the sky, my body replies. I step out into The Void and my senses take another battering. It is bonkers but brilliant. 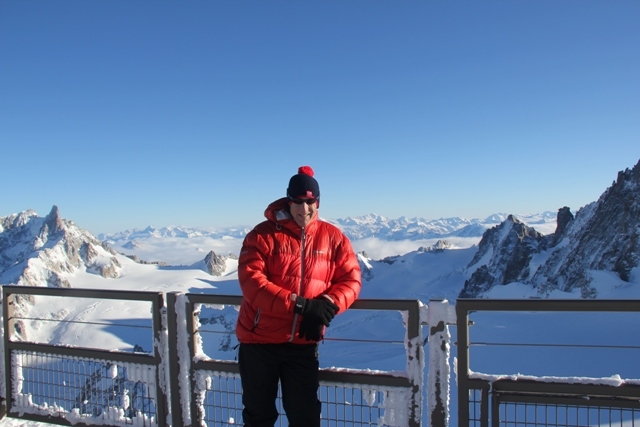 You can walk all the way around the Aiguille du Midi facility, getting the views from each side. In the summer, there is another cable car from here across to Italy which I’m told is an even better adventure. That then, is for another day. 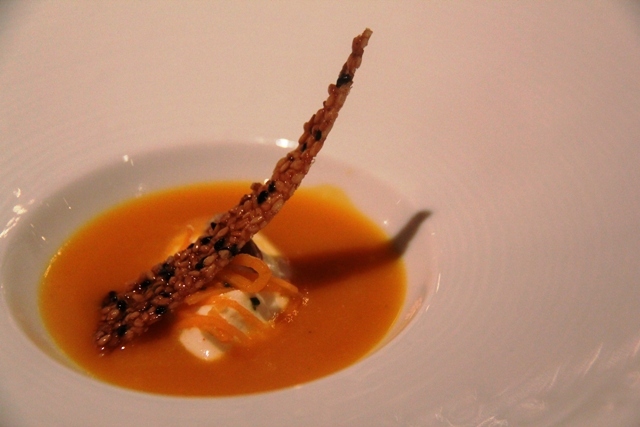 Back down in Chamonix I am having dinner at Restaurant Albert 1 ER Chamonix’s only 2 Michelin star restaurant. Le Hameau Albert 1 ER hotel has been owned and run by the Carrier family through five generations with Great Granddaughter Perrine now at the helm. Walking across the icy Chamonix streets and turning into the Hameau Albert driveway I know I am somewhere classy as the tarmac has under floor heating; not a drop of ice to be seen. My delicious starter of slow cooked free range egg (cooked at 62 degrees of course) with black truffle spaghetti is followed by shredded Skate wing with quinoa, fennel and lemon. 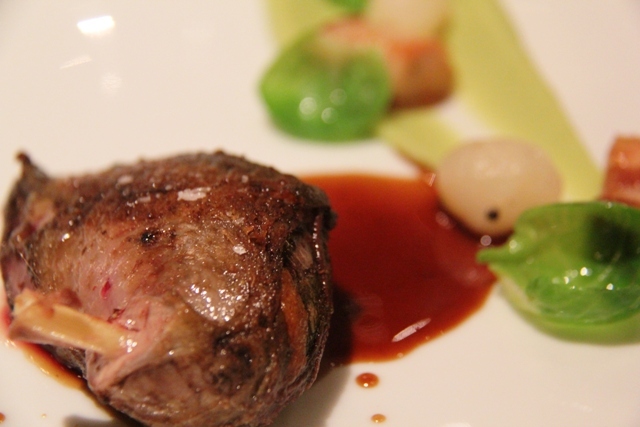 The main course is roasted pigeon breast with free range bacon, brussel sprouts and onions. 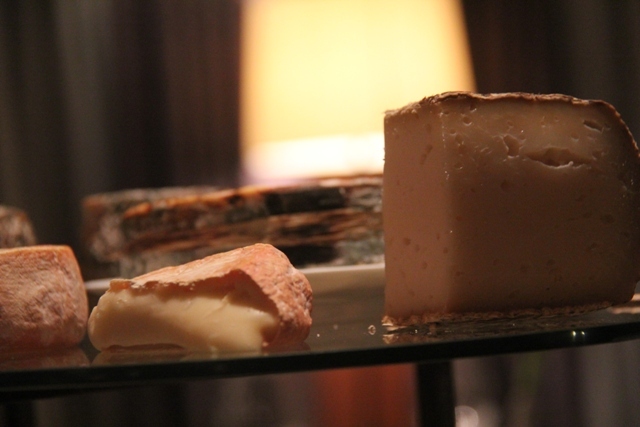 The cheese course is up next, this is France after all, a trolley laden with cheeses from Savoy and Italy. All this was marvellous of course, but for me it was the support act to the warm green Chartreuse soufflé with Chartreuse ice cream which was heaven on a plate. 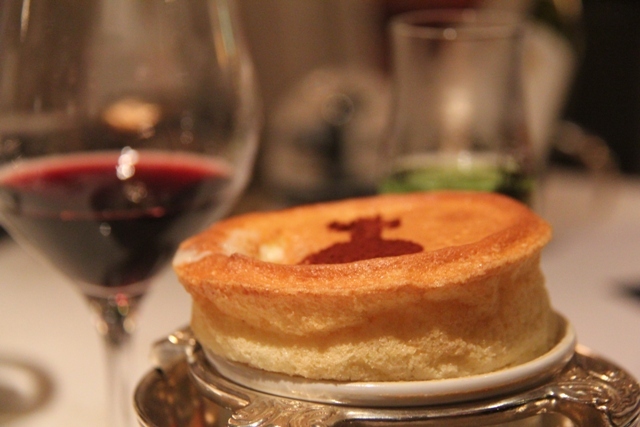 This tasting menu is a very affordable €92 with another €40 for wine pairing. I sit with owner Perrine for coffee and petit fours. “we think €92 is a good price for three courses” she tells me. 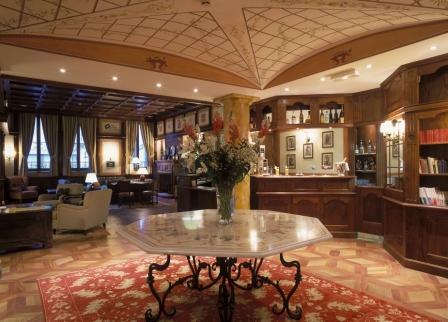 Albert 1 ER also runs regular weekend wine tasting sessions with a gastronomic lunch. A new day dawns and Chamonix is up and about early. The skiers are off to the slopes, but I pay a visit to Chamonix’s Alpine Museum; an impressive place chronicling the rise of Alpinism and the intrepid men and women who risked their lives conquering Mont Blanc. The collection has been studiously put together by Claire Burnet and even includes a copy of Smith’s Mont Blanc board game, artefacts on loan from the Alpine Club and many paintings and sketches from mountain artists. Not far from here is the fabled home of the Mountain Guides which is also worth a visit. It is a useful place to gather information on the area and upstairs I discover a scale model of the complete Mont Blanc massif. Chamonix is full of surprises. A lovely place to wander around, people watch and soak up the history. 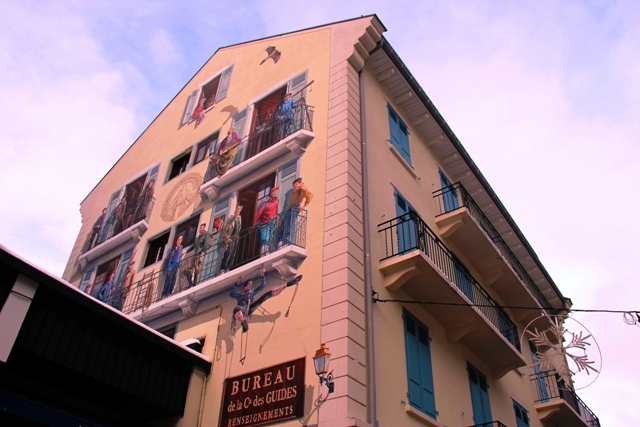 Just opposite the Grand Hotel des Alpes is a mural bringing to life all the mountaineers who made the village famous. After another splendid dinner at Le Bistro, which offered a menu suspiciously similar to the Albert 1ER complete with free range egg cooked at 62 degrees for another good value €85 I walk across for some live jazz at Maison des Artistes. Owned by legendary jazz impresario André Manoukian it is part recording studio and part late night jazz club. Some of the music is a little, let’s say specialist, for my taste but there are many fine musicians to be found. So is there enough in Chamonix for non skiers? There is indeed. Plenty of fun to be had for anyone who is not a committed skier. And you never know, you might just bump into James Bond. 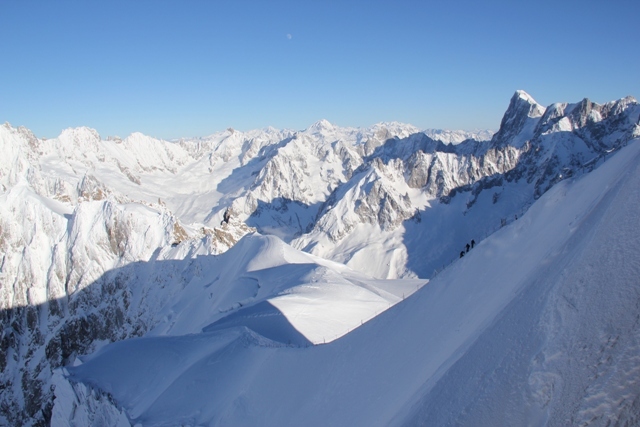 For more information on activities in the region please go to Savoie Mont Blanc region including information on the five ski resorts around the Mont Blanc Massif including Samoens. 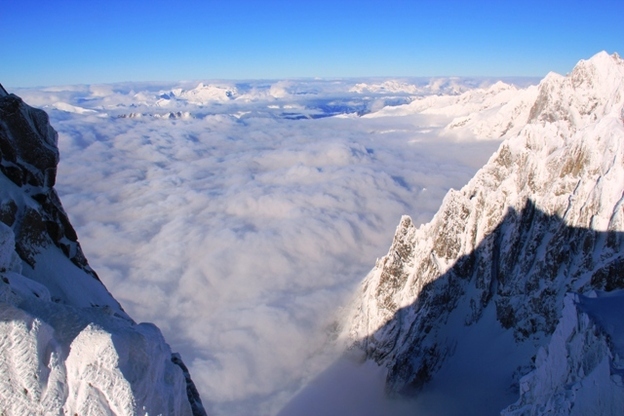 Chamonix is just a one hour drive from Geneva Airport. There are regular shared taxis to Chamonix or shuttle bus or private transfer. The tea-time and aperitif buffets are free. You just have to pay for drinks.